Sunrisers Hyderabad (SRH) is all geared up to face Delhi Capitals (DC) at Feroz Shah Kotla Stadium in the match no 16 of VIVO Indian Premier League (IPL), 2019. 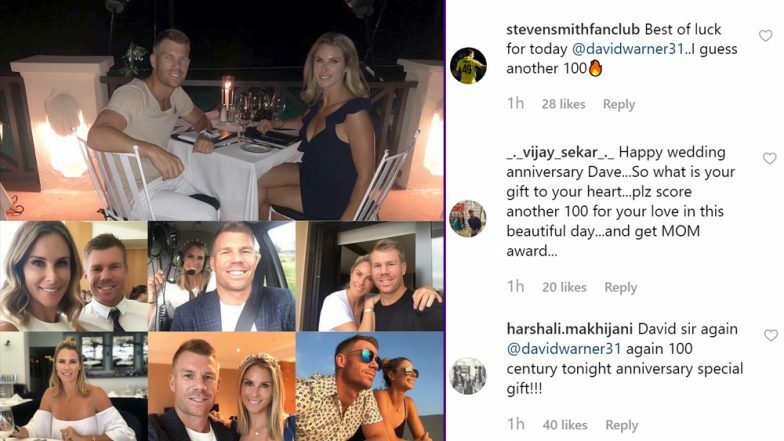 Ahead of DC vs SRH, Hyderabad batsman David Warner shares pictures with his wife Candice Warner on occasion of their 4th wedding anniversary. Warner fans want him to gift her spouse with one more ton in their clash against Delhi. Delhi Capitals vs Sunrisers Hyderabad Live Cricket Score 16th T20 Match. The Aussie cricketer David Warner married former Australian professional ironwoman and model Candice Warner in the year 2015. The left-handed batsman Warner made a strong come back in IPL this year, as he has scored a hundred and two half-centuries from three games. The SRH batsman Warner is currently wearing the orange cap, as he is the leading run scorer in this tournament till now with 254 runs. In his recent post on social media, the Hyderabad batsman appreciated her wife efforts for motivating him and igniting the fire in him to perform the best. David Warner Hits 4th IPL Hundred During SRH vs RCB IPL 2019 Match, Wins Back Orange Cap. SRH will be boosted with lots of confidence when they play Delhi Capitals in the game no 16 of IPL 2019, as they outplayed Royal Challengers Bangalore (RCB) in their previous encounter. SRH posted a massive total of 231 in their match against RCB, where both their openers scored centuries. Jonny Bairstow scored 114 from 56 balls, while Warner made an unbeaten 100 off 55 deliveries. Apart from that Hyderabad can again think of including Mohammad Nab, as the Afghan all-rounder had figures of 4/11 in 4 overs against Bangalore.